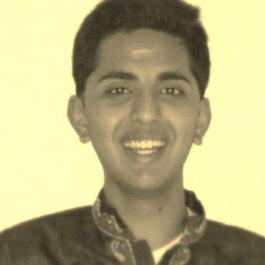 Varun is a high school senior at Santa Clara High School. From a very young age, Varun has exhibited a love for Carnatic music which has led him to his guru, Smt. Dhanya Subramanian. Varun has been learning Carnatic vocal from Smt. Dhanya Subramanian for the past 7 years. Varun has also learned western music on the piano for about 6 years. During his spare time, Varun loves to listen to music, play video games, and do puzzles. Aravind is the grandson and disciple of Vidushi Smt. A. Rajamma Keshavamurthy, a Rajyotsava Awardee and a renowned vocalist of in the state of Karnataka. 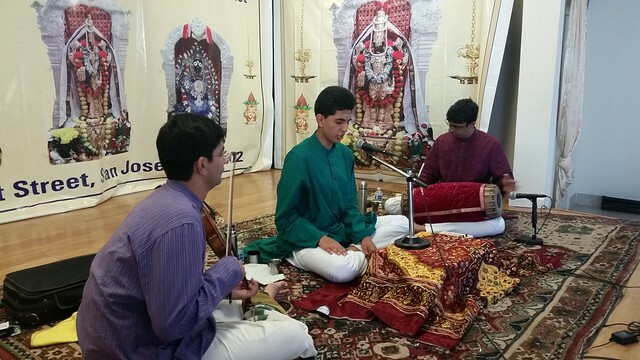 Aravind is the son & disciple of renowned violinist Vidwan Sri B. K.Sheshadri. He has had advanced training under Sangeetha Vidyasagara Violin Vidwan Late Sri R. R. Keshavamurthy. He is presently pursuing advanced training under his brother Anand Sheshadri who is a renowned vocalist and mridangam artist. Aravind has been performing from past 10 years at various Sabhas and organizations – like DD Chandana, Kamat group, etc. He has accompanied many budding and several renowned visiting artists in Bangalore, the Bay Area, and San Diego such as Vidwan Sri Vidyabhushana and Vidhushi Dr. Suma Sudhindra. Click here for directions to Balaji Temple.